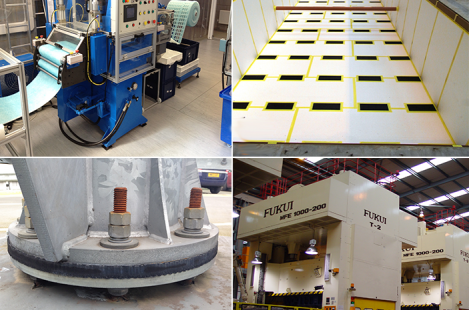 Farrat manufacture a wide range of materials to suit all types of industrial applications. Designing a resilient support or connection and selecting the correct vibration isolating or damping material for it can be complex, but we are here to help. Our team can guide you in your selection, so that you are confident that the material supplied is the optimum solution. 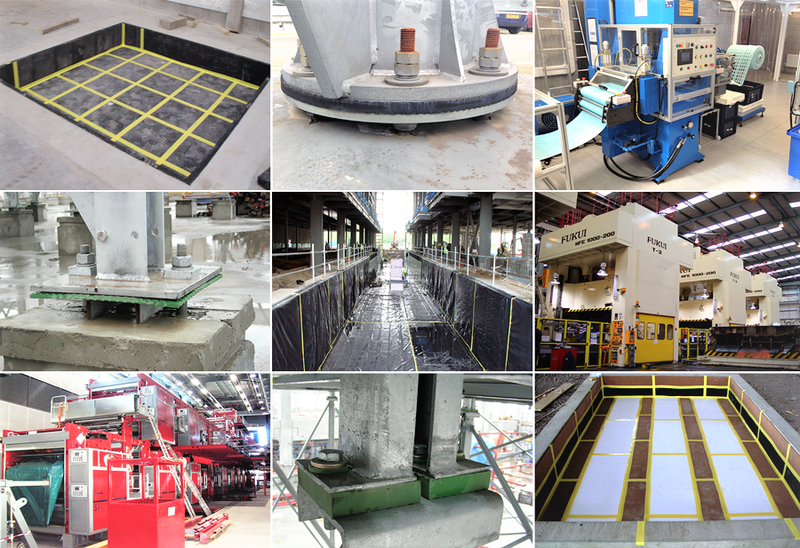 Free-standing installation on single-thickness pads. SG Machine tools and weaving machinery. BR Heavy cutting machine tools and impact machinery. BR Injection moulders and hydraulic equipment. 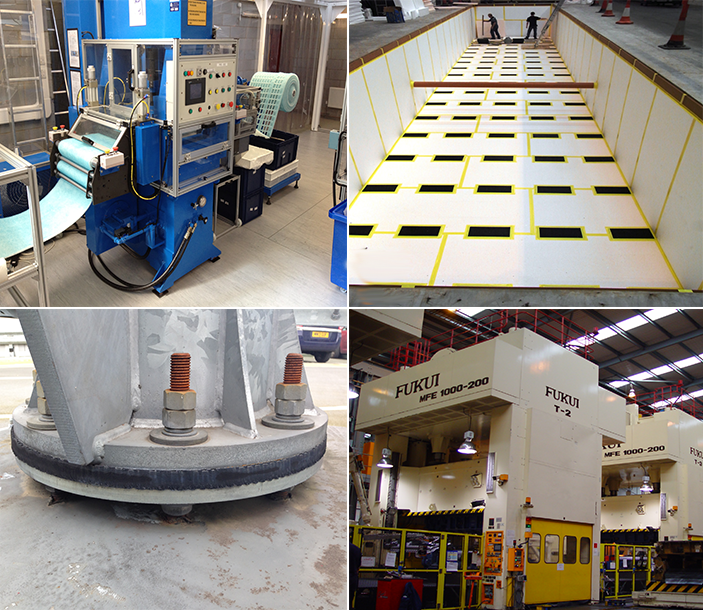 Isomat BR Power presses and impact machinery. Isomat NR Sensitive measuring, electronic and testing equipment. VM General machinery and equipment. SG Anvil pads and transfer machinery. 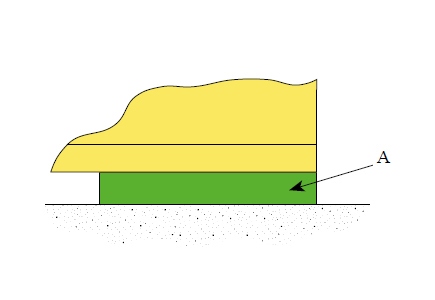 Free-standing installation on multi-thickness pads (A & B), with shims (C) placed in-between pads for levelling. 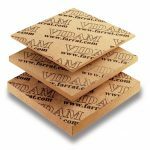 Shims (C) can be steel plates – tack weld multiple plates together – or Squaregrip SG2 P2 or SG5 P2 pads. 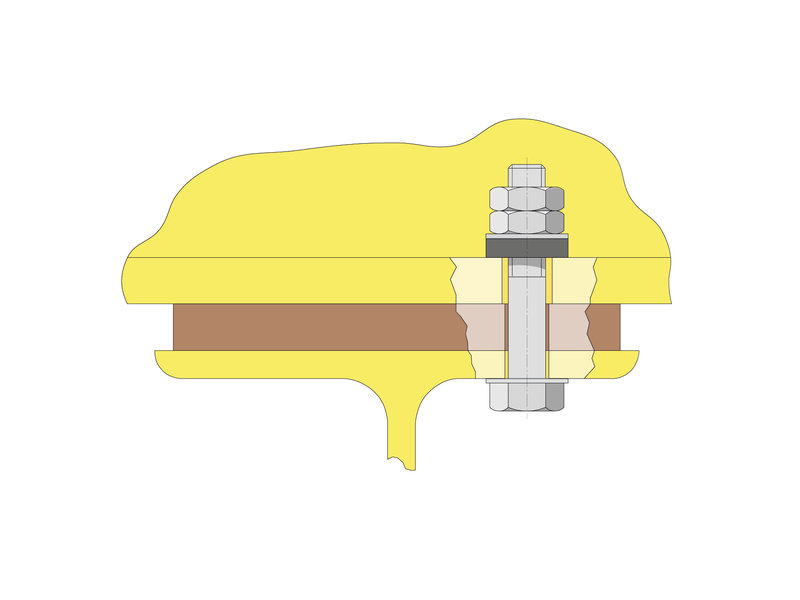 Bolt-Through pad installation using single (A) or multi-pad (A & B) configuration. 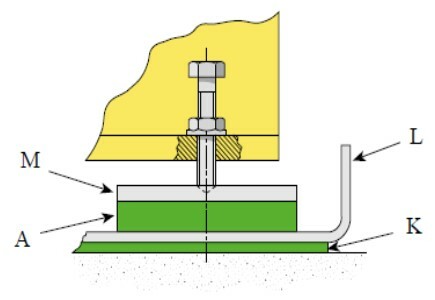 Anti-Vibration Washers (D) isolate the holding-down bolts. 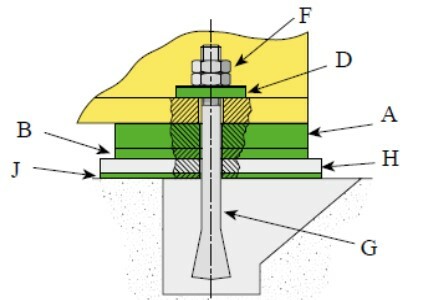 Sleeve bolts pass through the machine foot with the Isolation Bush (E), if space permits. Top-heavy or tall machines, e.g. power presses. Machines requiring extra stiffness or stability, so are bolted down, i.e. weaving machines and shipboard machinery. 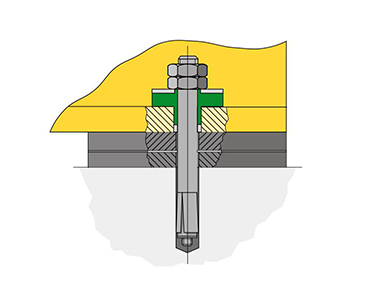 Bolt-Through pad installation with extra large Anti-Vibration Washers (D). For applications where high static and/or dynamic loadings are expected. Steel processing machinery or other impact machinery. Bolt-Through pad installations to steelwork support. Power presses and other impact machines. Process plants, pumps and compressors. Vibration damping pads (A) under steel spreader plates (M), installed in a drip tray. 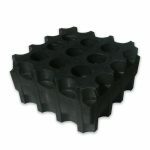 Drip tray (L) can be installed on Vidam 3 or 6 mm material (K), to provide good seating on floor. Machinery needing installation in oil drip trays. 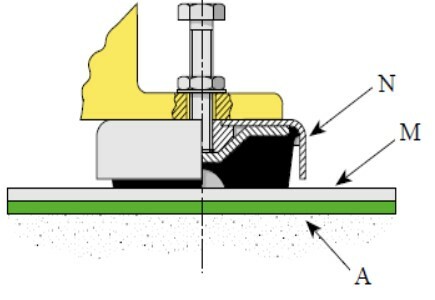 Vibration damping pads (A) under steel spreader plates (M) under adjustable mounts. ISOMAT IM Impact machinery, e.g. 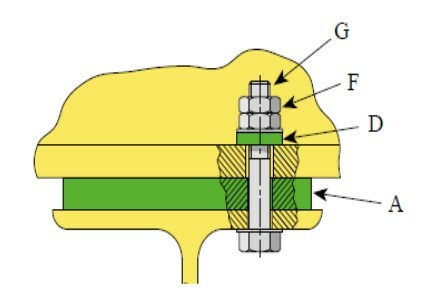 power presses, where very high shock and vibration isolation is required. Machines on suspended floors, where very good isolation is required. Materials are listed in order of load bearing capacity, with the lowest at the top. 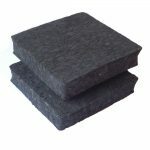 Recycled product made for Farrat using high quality rubber, foam and polyurethane materials. A Farrat classic. 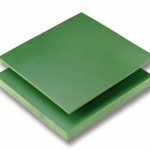 An ideal solution for a wide range of applications, produced in Nitrile, Neoprene and Natural Rubber compounds. A high-performance vibration and shock damping material with excellent chemical resistance to industrial fluids. 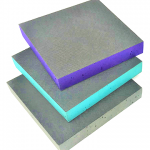 A key material in Farrat’s industrial applications portfolio. 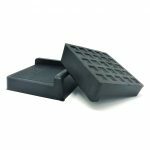 A high strength, stiff vibration damping material for machinery needing stiff vibration damped support with minimal movement. Treaded on both top and bottom to improve seating and grip. A non-treaded material with high stiffness and damping. 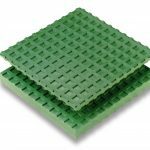 A simple, elegant and high-performance anti-vibration pad for lightweight machinery. Do you have a Bolted Connection? Farrat accessories be used in conjunction with Farrat vibration isolation and damping materials across a wide range of industrial applications, including but not limited to; Injection Moulding Machines, Hydraulic and Mechanical Machinery, Presses, Die-Casting Machines, Turret Punching Machines ,Packaging Machinery, Test & Measurement Machinery, Diesel Generators and Pumps & Compressors. The prediction, measurement and behaviour of damping in elastomeric materials is much debated and, as you will see from our Farrat datasheets, varies with material type, strain, disturbing frequency, and amplitude. Farrat have decided to use damping ratio, ζ, which, is the reduction in the vibration amplitude of a viscously damped system as a result of energy being dissipated as heat (converting of mechanical energy to heat). 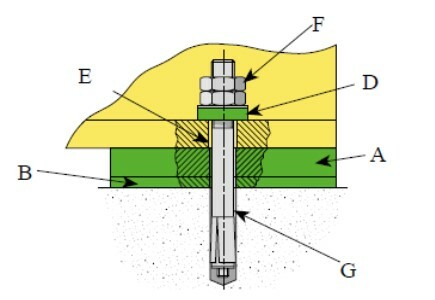 It is the ratio of the damping of the existing system to a damping necessary to make the system critically damped (ζ = C/Cc) and describes how vibration decays in the system after a disturbance. In a hysteretically damped system, the equivalent viscous damping ratio at resonance is given by ζ=0.5η where η is the loss factor which is defined as the ratio of the energy dissipated during one cycle of harmonic displacement per radian to the maximum strain energy (stored energy) in cycle. 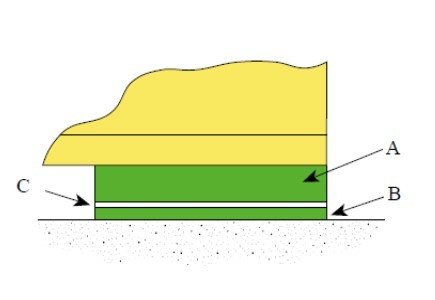 Damping can be introduced into the system to control its response when resonance is not avoidable. Our engineering capabilities allow us to help you choose the right vibration isolation materials for your application. 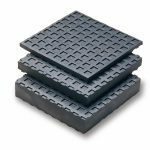 Our range of anti-vibration materials are manufactured in the UK and distributed worldwide across a wide range of industries. We are proud of the high performance these materials have provided our customers in their applications.